Man, Sam sure has just. Accepted her fate as a floaty plaything. 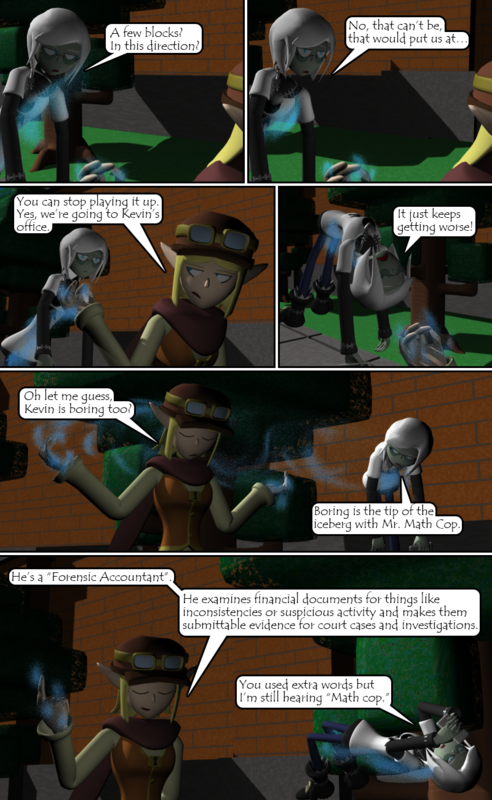 Also, “Math Cop” sounds like a really bad action film… but also kind of explains some of what he and Solstice have in common, lol. Solstice and Kevin really were just… close. They have an entire childhood in common. But I suppose you can say they are of similar intelligence levels. They wouldn’t be able to hang around each other for very long if they weren’t initially. This description of a Forensic Accountant was actually something I did write. It’s a real occupation that’s used in law and crime investigations that I just gave the barest minimum description of. “Forensic” simply means “suitable in court of law”. They also may be required to present the this information in court for cases. They also analyze a lot of data for income levels between parties and determine what kind of resources both sides have to pay out. Kevin has an insanely serious job here. Large accounting firms and other big companies also can have a forensic accounting department or some such to make sure their books are consistent and to investigate mishaps, meaning every big organization in-universe might have one as well and Kevin could have worked for any of them. He’s more than qualified.